WASHINGTON -- Canada agreed with the United States on Thursday that slow-moving talks to update NAFTA should continue although the two sides did not set a date, Canadian Foreign Minister Chrystia Freeland told reporters. 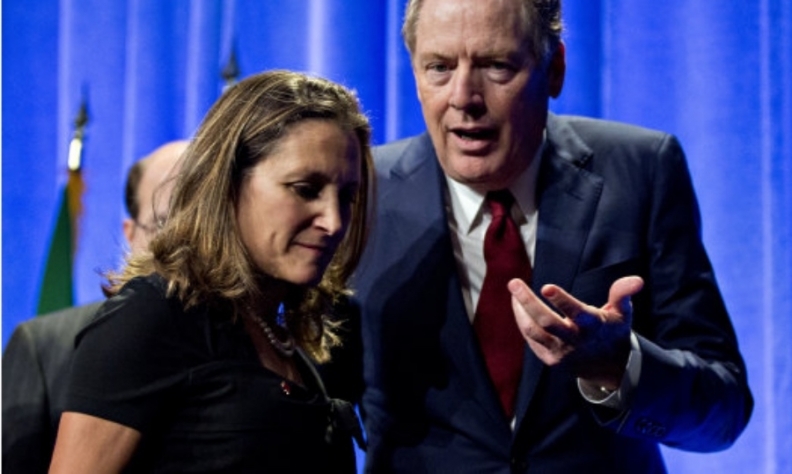 Freeland, speaking in Washington after she met U.S. Trade Representative Robert Lighthizer, also said the United States, Canada and Mexico agreed meaningful progress had been made so far on the North American Free Trade Agreement. Negotiations started last August and were initially scheduled to finish by the end of December. That deadline has been extended several times as Canada and Mexico struggle to accommodate far-reaching U.S. demands for change. "We decided ... to continue our negotiations on NAFTA," Freeland said in remarks shown on Canadian television. "We will be working hard over the summer." "We didn't set specific dates today. We talked about following up on setting up specific dates for meetings and that is what we are going to do," she said.